Technology-based education is being fuelled by the rapid advances in computer and information technology. It is no surprise that every aspect of modern life is influenced by the ease and speed of technology. In education, changes in assessment and instruction are emerging in response to important developments in educational standards and curriculum. Problem-solving, critical thinking, and analytical skills that can be used to accomplish tasks are emerging to the forefront. The advances in technology-based education is shaping new ways of teaching and new ways of learning. Digitally integrate AZCCRS, the new science standards and non-state-tested subject areas (e.g., art, music, etc) into curriculum, assessment, and reporting. Rapidly build and deploy (both online and offline) curricula including Instructional Units, specifying the scope and sequence of local curriculum, lessons, assignments, and assessments. Implement an effective and cost-efficient way to meet the recognized need for both students and educators to engage in 21st century learning, AZCCRS instruction, and assessments. To learn more about this initiative, watch for registration details or contact ATI. It has been a productive summer for all of us at ATI. One team focus has been to gain presence on additional statewide recommendation lists for state-aligned early childhood curriculum, assessment, and school readiness. ATI is proud to announce the following approvals for Galileo Pre-K Online. Early childhood educators in the states making the awards have the opportunity to choose Galileo Pre-K Online for use starting this fall! Galileo Pre-K Online has previously been approved for statewide use in New York and North Carolina. for the School Readiness Curriculum list. Pre-K Approved Program Curriculum list. approval for Online Assessment Tool. The Galileo curriculum includes an empirically-based scope and sequence that is linked to Galileo's reliable and valid multi-method authentic assessment tools. It contains child-initiated and teacher/parent guided activities reflective of current research findings as well as resources guiding interest area setup/use and room preparation. Continuous use of Galileo's research-based assessment scales provides actionable information on children's progress linked directly to learning opportunities provided through the curriculum. Assessment and curriculum integration helps guide developmentally appropriate planning to promote learning and school readiness. The Galileo system provides rapid access to the flexible curriculum and to ongoing assessment, actionable reporting, and classroom management tools enabling programs to empower children as learners and teachers as educators. Galileo also provides access to the Pre-K Parent Center which provides families with home activities and reports in English and Spanish. Galileo Pre-K Online is a research-based, data-driven approach to early childhood assessment and curriculum. It is an easy-to-use, comprehensive, online system with offline capabilities that seamlessly integrate assessment, reporting, and curriculum for use with children, infancy through 5 years of age. Galileo technology supports multi-method authentic assessments and reporting of children's growth and development with empirical evidence from assessments that are both reliable and valid. Supported assessment approaches include ongoing observation in the child's learning environment, one-on-one interactions, samples of children's work, and parent input. This broad range of formats accommodates the ways children from diverse backgrounds and abilities express their competencies and helps provide a meaningful portrait of each child's development for use in planning and providing developmentally appropriate learning opportunities. This individualized approach makes Galileo an excellent choice, especially for those serving dual language learners and children with special needs. ATI provides professional development in a variety of formats including on-site and online self-paced tutorials both designed to meet the needs of early childhood educators. Learn more about Galileo professional development options. We look forward to partnering with you and offering a system that assures program integrity, enables program accountability, and provides the support that makes a difference. Request your guided overview of Galileo Pre-K Online with a member of our friendly and knowledgeable Field Services team. Benjamin Franklin was a man ahead of his time in many ways, including education. The importance of applying learning that he speaks in the oft-cited quote above is one of the key themes of the Common Core. The Common Core asks not only have students mastered certain skills, but also if they can they apply them. Have they reached higher depth of knowledge? Can they think critically about information that is available and decide on a course of action? This emphasis has lead to recognition that assessments should become broader, more rigorous, and more relevant. Towards that end, new assessment items types have been developed that provide different types of tasks for students to complete. There has also been an increase in the use of project-based assessment requiring students to complete an involved piece of work with many steps. New types of items provide students with new novel and engaging tasks. Students might be asked to actually identify specific passages from a text that support a particular statement. They might be asked to sort items by a principle such as common cellular structure. These sorts of items make for an engaging and relevant evaluation of the skill being assessed. In May ATI released a series of short formative assessments showcasing several of these new types of Technology Enhanced Items. The assessments provided an opportunity to expose students to the types of tasks required by these items and to gain familiarity with what will be required of them when they take on the new state tests. Shortly ATI will be releasing Dialogs containing these assessment items. Dialogs are instructional tools that provide teachers with the capability to link instructional content with assessment items. The environment provided within dialogs allows districts to build project-based instruction and assessments that will afford districts the opportunity to provide students with rich instructional content that produces relevant assessment data about student learning. This fall ATI will be releasing units containing descriptions of some of the new item types and their use. Included in the units will be sample dialogs that can be readily edited to provide students with a chance to experience how the items work and the tasks that they require. They will also include sample performance-based assessments. We look forward to receiving feedback on their use. Galileo Dashboards are a convenient way to view and access your data related to curriculum, assessment, and instructional effectiveness from one single location. The Dashboards are presented in three views including: Teaching, School Performance, and Instructional Effectiveness. Accessing School Risk Level Summary data from the Galileo Dashboard School Performance view is now possible. Aggregated School Risk Level Summary data provides a quick means of observing by school or schools, up-to-date and actionable data on student performance. A bar graph displays the breakdown of students by risk level. 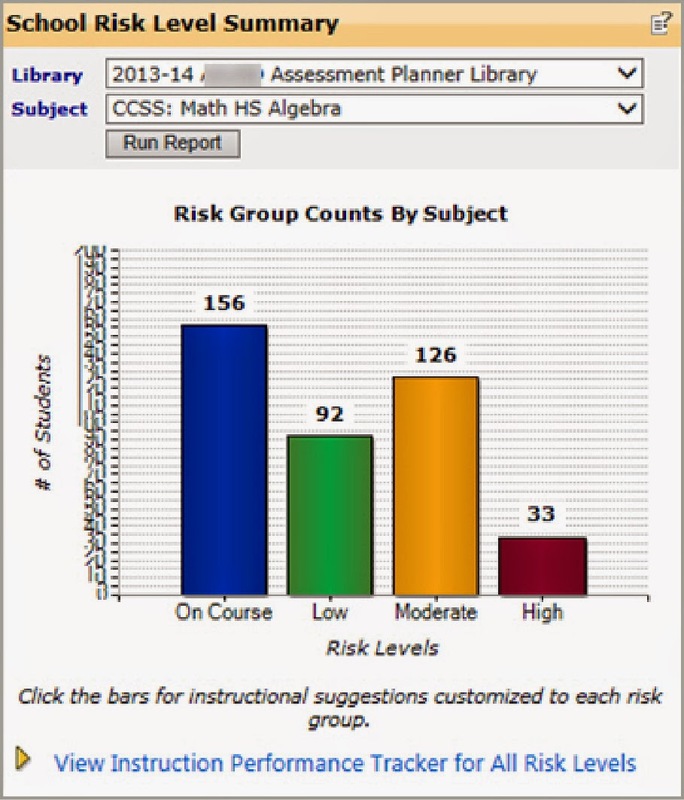 After selecting any one of the risk levels, an Instructional Performance Tracker appears offering intervention planning suggestions based on student mastery of standards. A student’s risk level of not meeting the standards on the next state standardized assessment is based on the position of the student’s Developmental Level (DL) score relative to the Meets cut score on each ATI Instructional Effectiveness (IE) and/or benchmark assessment. School Risk Level Summary data illustrated from the Dashboard School Performance view. To learn more about Galileo Dashboards, contact your Field Services Coordinator.